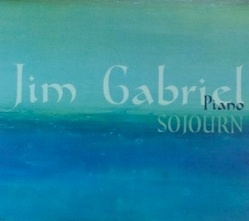 Sojourn is the stellar debut by pianist/composer Jim Gabriel. 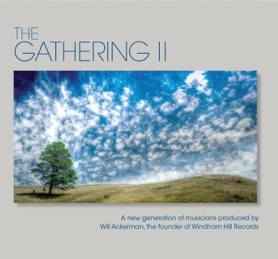 Produced by Will Ackerman at his Imaginary Road Studio in Vermont, the album is made up of four piano solos and seven duets/ensemble pieces that feature Eugene Friesen on cello (5), Charlie Bisharat on violin (2), Tony Levin on bass (3), Will Ackerman on percussion (1), and Jeff Pearce on Chapman Stick (1). The music is a fascinating combination of structured, melodic pieces and improvisations that are more ethereal and ambient. Two of the eleven tracks are covers that Gabriel has made his own. 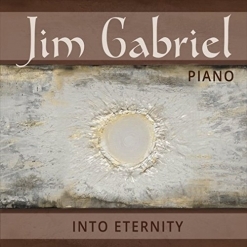 Jim Gabriel started playing the piano at the age of eight and continued his education all over the world, including working on a doctorate in Organ Performance from University of Washington before moving to Paris to study improvisation. Gabriel is the Choral Director at Cranbook Schools in Michigan, where he also teaches. His vast musical experience shines through in his original compositions as well as his playing, both of which are elegant and soulful. Sojourn is an extraordinary album and sure to be one of my favorites of 2014. Sojourn begins with “South Bend, Indiana 1989,” a tender and delicate piano solo that sets the tone of the album. Very open and free, it’s a quietly bittersweet reflection on something from the past. “Chaccone” is an incredible duet for piano and cello. Built around a repeated bass pattern, the first half of the piece is just piano. As the cello enters, the music really takes flight. The last movement becomes very serene and gently drifts off at the end. “Spring Reverie,” also a duet for piano and cello, begins softly and builds slowly. The middle section becomes passionate and then gradually calms and fades out. The title track is a quartet featuring Gabriel, Ackerman, Friesen, and Pearce - definitely a favorite! Haunting and full of longing yet freely expressive, it’s a breath-taking piece! “Closest Night” returns to solo piano: open, free, and from the depths of the soul. Much of this piece is played in the lower registers of the piano, creating images of darkness and stillness. “Dayspring” takes us in a different direction altogether. Light and carefree, Charlie Bisharat’s violin takes us soaring through fluffy white clouds as Gabriel’s piano dances and swirls with joyous abandon. “Retrospection” is another favorite. A very subtle piano solo, the damper pedal holds many of the tones, creating an incredibly atmospheric, floating feeling that is both dreamy and suggestive of the passage of time - an amazing effect that is whole lot more difficult than one might expect, as excessive use of the pedal can turn the music to mud in no time. “Lost Chances” brings Bisharat back and adds Levin on bass for a poignant, nearly heartbreaking reflection on what might have been - love it! The two cover songs are “Your Hand in Mine” and “To the Sky,” and both are gorgeous. “Hopes Forgotten” is a passionate and deeply moving trio for piano, cello and bass. My one-word review of Sojourn and Jim Gabriel’s music would be “Wow!! !” Be sure to check it out for yourself. It is available from Amazon, iTunes, and CD Baby, and I give it my highest recommendation.